Here are some excerpts from the chapter, Get Them Marking! from Igniting Response (to our Conducting), Publication: 2019. If you'd like us to notify you when Igniting Response (to our conducting) is available, click here. We won't sell, give, barter, gift, re-gift or lend your information to anyone. That's a promise!!! Now, put these ideas to work and get them bringing pencils and marking! Expresses students' respect for us as musicians and teachers. Validates our authority and the value of our comments and gestures. Shows that students' self-talk is, "I'd better mark that down!" Tells us they understand that marking the music is taking notes in Music class. Additionally, marking the music is essential for effective rehearsing and high quality performance – not only because of the musical information contained in the markings, but also because the act, itself, increases students' attention, involvement, and assumption of responsibility. And, as you'll see in Component 6, below, making marking exercises part of your warmup will sharpen watching skills. And we all know that the making kind of inspired music that made us want to teach music just isn't possible without marking. Here are some perspectives, approaches and techniques that I found work consistently to get them marking. Marking the music is - like watching - a complex action with many components; as we well know, it's not “Mark it!” and it happens. If it were simple, our students would do it regularly and, while it's second nature to us pros, it isn't for our young musicians. They need to learn why to mark, when to mark, what to mark, how to mark, and what we mean with our words and gestures. They need to experience the benefits of marking and the consequences of not marking (they have to wait since you absolutely will not continue rehearsing without it). Addressing these issues requires persistent, challenging work with the students on our part. If we don't make an ongoing, no- compromise effort, students rarely mark their music as a matter of course, and teachers' lounges are filled with comments that "...today's kids never mark their music." 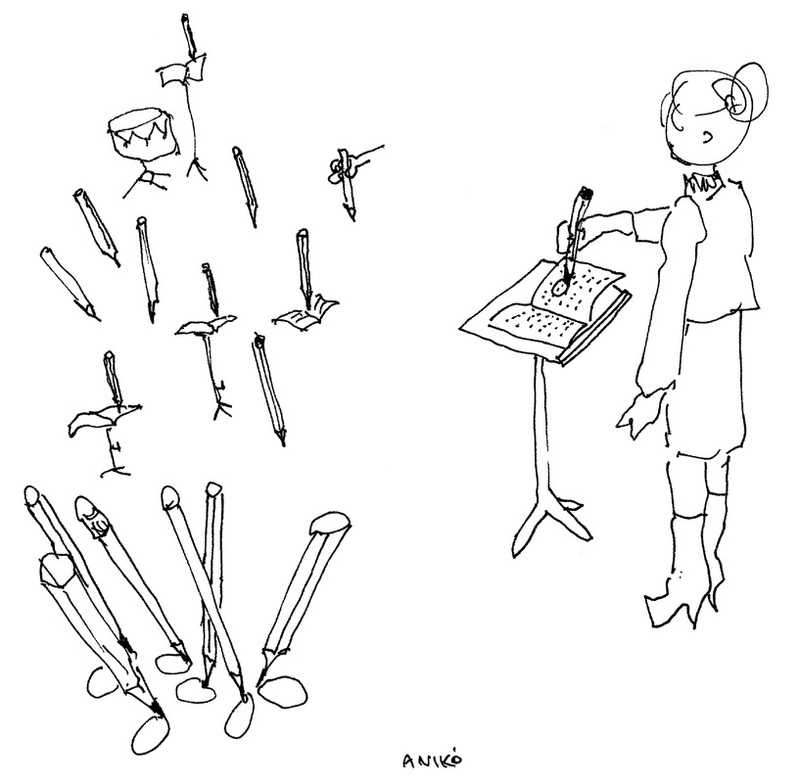 Aniko's drawing shows what we want to happen when we tell young musicians to "Mark it!" This chapter suggests ways for this to happen without our having to say anything! No...really! I know this from my own experience! It's my experience that ensemble members in any grade and at any level can learn to mark their music consistently - and observe their markings. Here are some ways of making sure the many components of teaching and learning Marking are in place. The fundamental issue in marking has to do with our commitment - not our students’. Have we decided - absolutely - that marking is non-negotiable: all ensemble members must absolutely bring pencils and mark their parts? If we haven't made this decision – or don’t continuously implement and insist on it - our students won't bring pencils and won't mark...and the responsibility is ours, not theirs. As professionals, we know how important it is to mark; few of us would go to a rehearsal without pencils and fewer still wouldn't mark. Since we've personally experienced the importance of marking, why wouldn't we insist on in with our ensembles? The first step, then - the absolutely necessary and fundamental one - is our committing to doing whatever it takes for our students to mark. This can be challenging because it’s hard to change habits – in others and in ourselves, as well. The students are sure to become impatient, roll their eyes, pretend to mark (“air pencils!”), complain to each other – all of it. But if we persist gently and with humor, marking can become part of our ensemble culture, and all will reap the rewards. In time - usually sooner than later, they’ll appreciate your caring enough to insist on their best; this can translate into more improvement, engagement, and greater satisfaction for them and for you. Since experience teaches far better than information does: help students experience the benefits of marking. When we do, they'll be far more likely to mark than if we call out, "Mark it!" Which isn't much information, anyway. Hand out some simple music and play two or three phrases. Stop three or four times to make a comment, then play it again from the top. Were your comments observed? It's doubtful. Now play through the same music, stop to make the same comments but this time insist that the students mark your comments in their music. Finally, play through it again - is there a difference? Of course! Point out they've just experienced how much better their music making is when they mark...and that they'll play more and rehearse less when they mark and follow their markings. And as we all know: more playing + less rehearsing = more fun! Variation: (secretly) appoint a student to record your comments and gestures over the course of a rehearsal. Then, towards the end of the rehearsal, ask your ensemble to recall all your comments. They won't be able to, of course. You might then have the student read your comments...or say how many you made. This can be a powerful demonstration of what research has consistently shown - people forget most of what they hear if they don't write it down. And if this is true, do we want to take rehearsal time to make comments that won't be remembered? Students' not marking their music is a powerful factor in "not having enough rehearsal time. What are the three things all musicians need at rehearsals? Right! Instruments (for singers, their vocal cords), music, and pencils! All three. Insisting students bring pencils sends the message: you need the right equipment...here in rehearsal and out there "in life." Carpenters wouldn't go to work without tools, athletes without uniforms, or accountants without calculators. And students wouldn't go to History or Math without pencils, would they? Bringing a pencil to rehearsals, then, is "taking notes in Music class." By helping them realize that "bringing pencils" is as much about preparing for their future as it is about the music, you'll be focusing on their needs and their futures. The result: they become more engaged and more likely to bring pencils. And, of course, it can be effective to factor pencils/marking into their grade. Do make sure everyone brings at least one pencil – two is better. You might find, as I have time and time again, that a few will start bringing in a dozen or more! Assign section leaders the responsibility of making sure everyone in the section has a pencil on their stand (and not in their instrument case or backpack). Section leaders may have to have an extra supply as part of their job description. Create a "Pencil Patrol" to ride herd on the section leaders. Do not start rehearsing until the section leaders report to you that everyone has a pencil. You might ask younger students to organize contests for who has the most unusual, prettiest, brightest, etc. pencil – make pencils a thing and part of your ensemble’s culture. However hokey this may sound, it works...even if they tell you it doesn't. Since young musicians usually don't know how to mark their music accurately, do provide a set of markings organized by category; for instance: dynamics; expression; note accuracy; rhythm, ensemble (who to listen to, watch conductor), etc. What others can you think of? * Use a wooden - not mechanical - pencil, and mark dark! * Mark well before the "action spot;"
To help you come in with your quarters at the right tempo: mark "Alto"
Make up your own examples based on your experience and your ensemble's needs. Also: consider appointing a student committee to teach new students how to mark. When you do you'll be creating a “culture of marking” that (with gentle reminders) will endure. Young musicians become more engaged - and more likely to mark their music - when we mark ours. As you rehearse, ask (your own version of) questions like: "Who needs a really clear cue at letter B?" …then mark your. Or: "Should I make my crescendo bigger at 45?" ...then mark your score. You might also stop the rehearsal to mark something important...and tell the students why you stopped. When you do mark - and want them to mark the same thing (as in the crescendo question, above) - you might - depending on your personal style - make a bit of a show of it. Hold your pencil up to the light to "make sure the point is sharp enough"....or: scratch the pencil against your stand so they hear that "picking-up-the-pencil-to-mark-the-music" sound. That's sure to get their attention and provide strong modeling in a friendly way. We know how important marking is, but unless we spend time teaching and practicing it, students won't take us seriously. If we say: "Mark your music!" but our actions say: "It's not important and I'm not going to teach you how or rehearse it or insist on it..." we'll be sending mixed messages that actually discourages students from marking. As professional musicians, we well know the importance of marking and unconsciously assume the students do, too. Of course, they don't, so we must practice marking enough at the beginning of a semester to send the message: marking is really important – that’s why we're making it a regular part of our rehearsals. Here's one way to do it. 1. Prepare and hand out a simple piece, perhaps a chorale arrangement. to mark your gestures and comments into the music. think you showed and said may not be understood by all. effectiveness of your gestures and verbal communication!). 4. Ask them to compare their work with a partner and ask you questions. This is a terrific exercise in both marking and watching. Doing these exercises regularly can make students' marking (and watching and following your gestures) skyrocket! Make up your own variations by having them conduct what they saw, etc. It can be very effective to have students come up and conduct! Do this regularly, starting with the most basic music, then moving on to the music you are rehearsing. THIS IS THE MOST IMPORTANT ONE: After you've made a comment or new gesture: wait until everybody - EVERYBODY - marks it. Enforcing your instructions is vital to getting what you want even though it may be uncomfortable. Since enforcing creates the results you want, it's the Number One Way to create enough rehearsal time (this is also true for watching and observing your gestures). If we start rehearsing before everyone marks, we’re sending two powerful messages that undermine our work: 1) marking isn’t important, and; 2) the students don’t have to follow our instructions. What's more, we’ll find ourselves making the same correction rehearsal after rehearsal, with limited results. This wastes rehearsal time, undermines our authority, and dilutes their confidence in our ability. Just as with other things we tell them, we must be careful to reinforce marking! What if – after you’ve made an important comment that few/none mark in the music – what if you waited with a pleasant expression on your face. You look at them...they look at you (this is how it really goes - I do this all the time)...you keep looking at them....they look at each other: What's up??? You smile. Maybe you pick up your pencil, nod to it, and mark something in your score, then look at them like "Does that give you a hint of what I'm waiting for?" Don’t say a word, just wait. When your students become thoroughly, totally convinced that you won't start unless they mark – then they'll start marking. Do this every day - no matter how hard it is for both you and your students - and you'll create a culture of marking in your ensemble, the music making will improve, corrections will carry over, responsibility will be transferred to the students, you'll have more and more rehearsal time, and you'll be a happy, happy conductor. Just visualize your students marking your comments and gestures automatically: Joy! You can do it! * Look at a student who is marking and ask aloud what s/he is doing. This is tough...but the results can be amazing! Teachers and students will need to move out of their comfort zones during this process. Enduring students' eye rolling, looking at each other it, etc. etc.is tough. But when the marking does begin to happen–and it absolutely will if you persevere and endure–you'll have created a culture of marking that will result in dramatic, inspiring musical and personal growth. ...and you'll have more rehearsal time! If we think there's not enough time to do this, let's ask ourselves, "What if they marked our every comment and gesture without being told?" Right! We’d save far, far more rehearsal time than we have to invest in teaching them to mark. Invest the time at the beginning of the semester. It will pay off and pay off. And you will create the kind of inspiring experience that made us go into teaching in the first place! The young musicians may think marking means the action will happen all by itself. Alas, marking is an important step, but it's only the first step; they must then practice the marked music…or the marking won’t be followed. It’s like putting a note on the wall to ourselves “Do the dishes!" and thinking the plates and glasses will sprout arms and legs, wash and dry themselves, and leap into the cabinet! Very important, then: play/sing through the music slowly to rehearse what they've marked; this will reinforce both correct execution and your seriousness about marking. Yes, this approach does take time. But, like training puppies, it's better to establish a habit early on than to have to clean up later! And without marking and observing those markings, they'll make the same mistakes again and again. And they'll learn those mistakes real good! Perhaps the most important components of this approach are 1) your being convinced of the importance of marking, and; 2) not starting to rehearse until your instructions, gestures, etc. have been marked by everyone...yes, everyone! Click here to be notified when Igniting Response (to our conducting) becomes available. We won't sell, give, barter, gift, re-gift or lend your information to anyone.